Identify metal ceiling systems’ typical components and configurations. Explain design considerations when selecting metal ceiling systems. Describe multiple performance, durability, safety, and sustainability attributes of metal ceiling systems. 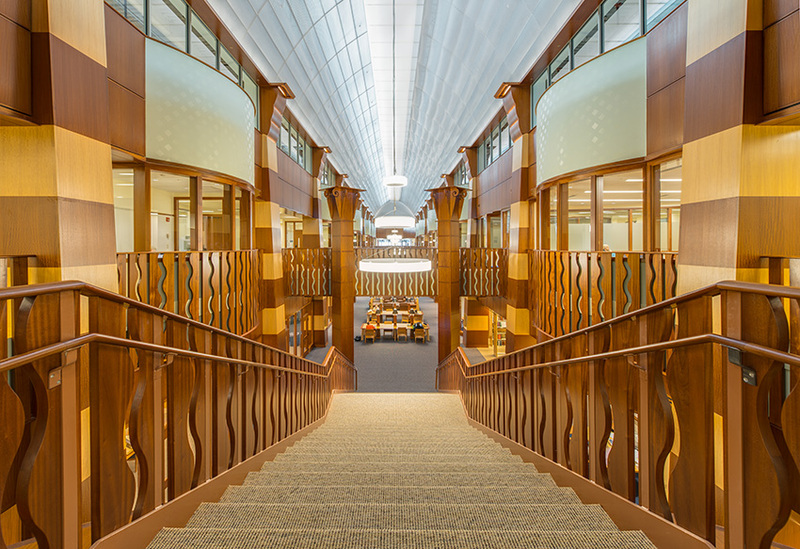 Recognize best practices in installing and maintaining metal ceiling systems. Architects and designers enjoy the creative potential and customization of metal ceiling designs in commercial buildings. Not only do these ceiling systems conceal, but they also attract attention with dramatic designs and decorative flourishes. These systems can be specified for both interior and exterior applications and incorporated into all projects from airport terminals and train stations, to shopping malls and casino floors, to office lobbies and hospital corridors, to school classrooms and college stadiums. Metal ceiling systems meet rigorous performance requirements for acoustics, wind loads, humidity, fire, earthquakes and sustainability, as well as provide mechanical systems’ accessibility and low-maintenance reliability. Contractors also appreciate these cost-competitive ceiling systems and their ease of installation, contributing to labor savings and on-time completion. The challenge can be in balancing all of the features and benefits to determine the optimal metal ceiling system for the project application. 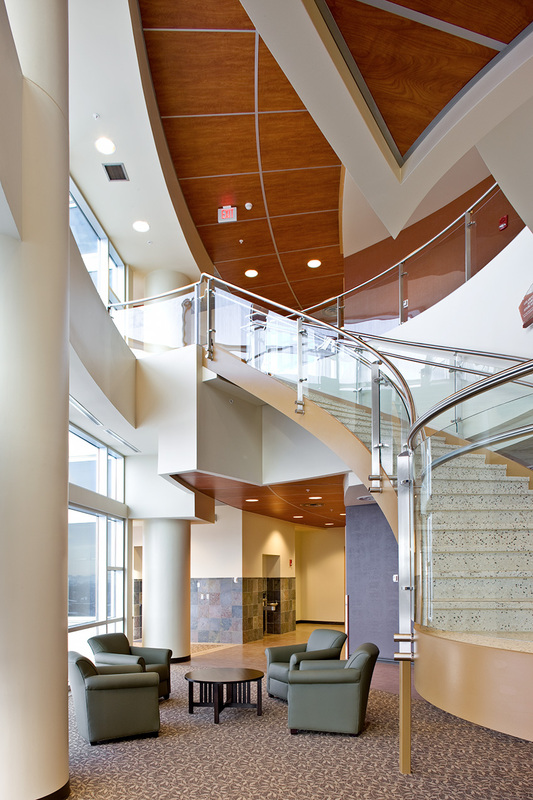 Quinnipiac School of Law features a torsion spring concealed metal panel ceiling system with Satin Silver finishes and increased acoustical performance. The main runners of the ceiling suspension system also provide direct support for the cross tees, air diffusers, lights and other devices, as well as the panels. The plenum is the space above the ceiling panels that conceals the HVAC air return, piping, wiring and/or ductwork. Today’s commercial spaces feature suspended ceilings made from aluminum or steel with panels from a wide range of materials. Steel was the original material for modern suspension systems and continues to prove reliable for heavy-duty applications. Aluminum’s inherent corrosion resistance is suitable for both interior and exterior installations. Compared to steel, aluminum’s lighter weight also makes it the preference for many contractors. Soft panel ceilings for interior applications commonly include gypsum, mineral fiber, fiberglass and stone wool. Gypsum is a soft sulfate mineral used in plaster, which can be shaped into panels. Mineral fiber is a mixture of fibers that may contain cellulose, paper and clay, which are shaped into panels using either a wet felt or cast process. Fiberglass is spun glass fibers, which are shaped into ceiling panels and given a decorative surface with a different material such as vinyl. Stone wool is primarily basalt, an abundantly available volcanic rock. Hard ceiling panels, such as those made from wood and metal, are more durable than the soft options. Metal offers superior performance attributes and does not have the humidity and acclimatization requirements of wood. Tin and copper ceilings were the first metal ceilings introduced in the late 19th century. Compared with the elaborately decorated plaster ceilings of the 16th century, these pressed metal ceilings could be mass-produced at a fraction of the cost, and installed in a fraction of the time. Many historic tin ceiling patterns are still available today. 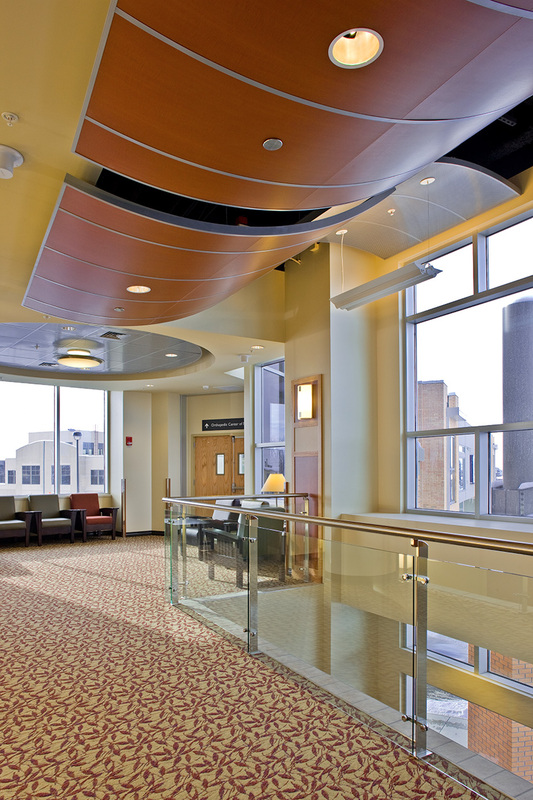 Benefis Health System’s snap-in metal plank and curved metal ceiling systems are finished to achieve the look of wood for a warm, comforting space, without the demanding maintenance of real wood. The original pressed metal ceilings were the “nail-up” variety, meaning they were installed with nails over wooden furring strips. This method is still used today, and a “lay-in” metal panel style also was developed in the 1950s to interface with ceiling suspension systems. From the mid-20th century to current times, metal ceiling panels are manufactured from durable steel and aluminum. A modern variation to the lay-in system is the “snap-up” system. This system hides the suspension grid, provides very tight joints, and can be specified to provide additional security. Clip-in metal ceiling panels are easily removed and replaced into standard suspension systems, which can be helpful for spaces that must quickly adapt to changing décor and tenant needs. All clip-in panels are installed over a new or existing ceiling grid. Hook-in and hook-on metal ceiling panels, as their names describe, are installed by hooking into specialty drywall suspension systems. Panels can be removed or replaced easily without tools to achieve downward access to the plenum. 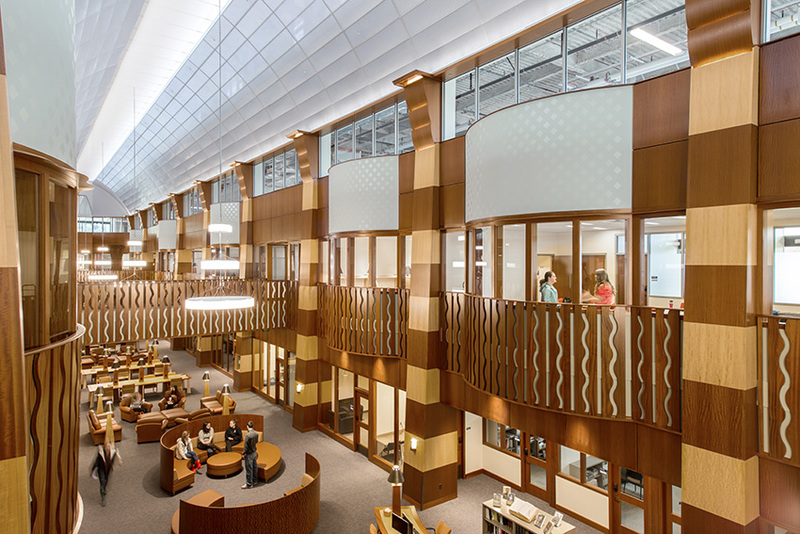 Torsion spring metal panels integrate seamlessly with factory-slotted suspension systems to provide a clean-monolithic concealed ceiling solution with ease of accessibility for Quinnipiac School of Law. Also ideal for frequently accessed plenum areas, torsion spring panels allow maintenance staff access without taking the panel completely out of the ceiling. Torsion spring panels can be specified for flat or curved installations. Because of the strength of the connection to the grid system, this type of system can be effective in areas concerned with seismic activity. Clip-in, hook-in, hook-on and torsion spring panels generally are fully accessible systems, where the plenum can be accessed at any point. This is almost always preferable to a point-accessible system where the plenum can be accessed only at specific locations, or to a progressive accessible system where panels and components must be removed in sequence until the desired point of access is reached. Metal ceiling panels that have a length that is greater than two times their width, are called planks. They are used as design elements to cover large areas and provide accessibility. The decision of attachment styles is based largely on the frequency of access to the plenum. Ideal for large public spaces and as design features in offices, planks can be formed into custom shapes.